MAC Cosmetics remain to be at the top list of my favorite brands. Despite the fact that I try not to, considering that it's very expensive, it provides me with a lot of reasons why I should save a few pretty pennies for it. Much to my surprise, I never really liked MAC lipsticks before. It made my lips dry and I couldn't stand the taste of it then. I remember when my mom bought me the shades Brave and Skew, I barely used them. It was just for special occasions or when I want something "sosyal" to take out from my purse when I'm out clubbing. But really, it was all a bad experience. But what made me change my mind and rethink on MAC lipsticks? 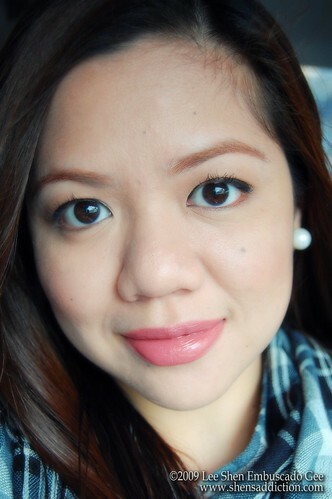 As my knowledge grew about makeups (i'm not saying I know it all), I realized that I had to give it another chance. My friends who were crazy about them gave me reason enough to try so I did. Since then, I just loved it. But why Cosmo of all lipsticks from MAC. I remember when Sophie and Jheng raved about Cosmo and I think at that time Sophie lost her Cosmo lisptick during a shoot or a class. Since then, Cosmo was stored at the back of my mind as one lipstick that I should consider. 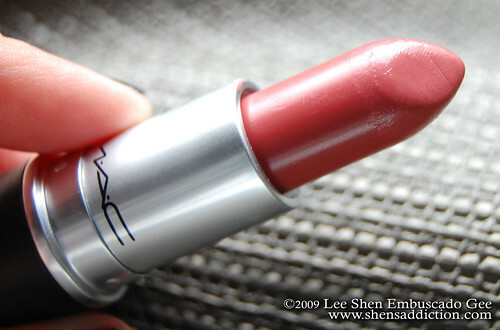 But every time I look and swatch it during one of my many MAC visits, I can't seem to like it. It was such a blah color for me. The addict in me finally gave in. Shoot me for being such a shopaholic but I bought Cosmo only out of nothing. No reason at all. Truth be told, it was months before I even used this for the first time. It was just sitting on my stash like a reject from school. Boy oh boy was I wrong! :) I really really made a serious mistake not buying it sooner or calling it a blah. Cosmo is such an amazing color for my NC30-35 skin. The color has a pink-peach-taupe tone to it that I can't describe. Sometimes it looked peach or pink depending on the lighting. This shade glides on smoothly and its very pigmented. So, what do you think? Love it or hate it? this looks beautiful on you! i was considering getting it and now i really want it! i just got craving today but i think i'll have to go back and pick up cosmo as well. the colour is beautiful on you!